Daniel Black – 2B – OK. 0-4. 2K. Drafted by Florida – 14th. Zach Neal – RHP – OK. 7IP 5H 1ER 1BB 7K. Was fantastic and left after 104 pitches. Drafted by Florida – 17th. Steven Buechele – 3B – OK. 1-5. 4K. Swung and missed some pitches by 15 inches. Drafted by Texas – 18th. 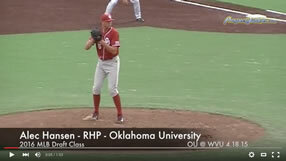 Jeremy Erben – RHP – OK. 4IP 2H 0ER 1BB 1K. Drafted by Arizona – 22nd. Tyler Ogle – C – OK. 2-3. HR (11). His 12th inning go ahead HR was his second HR in as many days. Whit Merrfield – OF – SC. 0-5. Drafted by Kansas City – 9th. Blake Cooper – RHP – SC. 5.2IP 4H 1ER 2BB 6K. Drafted by Arizona – 12th. Bobby Haney – SS – SC. 1-5. K. Drafted by San Francisco – 22nd. Matt Price – RHP – SC. 3IP 0H 0ER 0BB 5K. Gamecocks gave up the lead 1 hitter after he left. Jackie Bradley Jr – CF – SC. 1-6. RBI, K, BB. Comes up huge with an RBI single with 2 outs in the bottom of the 12th to tie the game. Scored the game winning run later that inning.